Just a few of the amazing weddings we've been privileged to be a part of. They're all beautifully unique and feature some of our rustic and reclaimed wedding hire collections. We're also proud to give shout-outs to a few incredible suppliers we love working with. Feel free to look them up, they're all wonderful people and would be delighted to hear from you! 31 March 2018 - Rachelle and Ben married under our two-post wedding arbour styled by Bethany Jane Design in the stunningly gorgeous Adelaide Town Hall. At their reception, our reclaimed Oregon chalkboard artwork was designed by the wonderful Lauren May Creative. Our hand-painted logo by Lauren May Creative! 15 March 2018 - We cannot speak highly enough of film maker and photographer Sam Lecons. Professional, inspirational and genuine - that's Sam in a few words and he is an absolute pleasure to work with. We've worked together on a few different projects including our video on making chairs in the workshop and our filming and photo shoot at Stangate House, Aldgate. 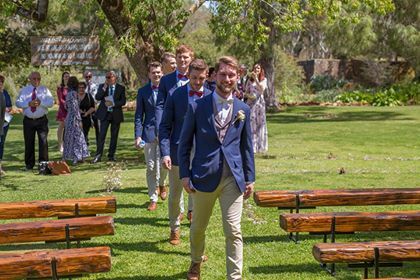 12 December 2017 - Liam and Lauren married at the stunning Woodhouse Manor, Piccadilly hiring our wedding ceremony benches and hand-crafted reclaimed Jarrah chairs. Their aisle was bursting with joy! There is so much colour and texture in these amazing shots by Story Studio, a little Adelaide Hill's drizzle couldn't keep anyone's spirits down on this magical day. Liam & Lauren's Wedding ceremony - Photography by Story Studio. Liam & Lauren's Wedding - Photography by Story Studio. 21 October 2017 - Today we're on site at Angaston Town Hall with Love Cherish Adore. 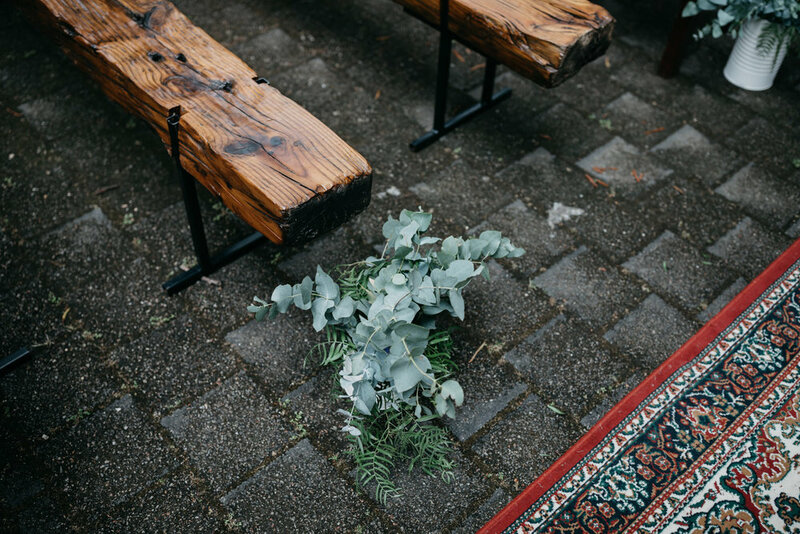 We've set up our hand-crafted two-post wedding arbour and ceremony benches out the front and are meeting some wonderful couples as they take in all the wonderful wedding inspiration inside this heritage building. If you're a South Australian bride (or even from further afar!) you definitely want to be following Love Cherish Adore on Insta @lovecherishadore for stunning wedding inspiration, updates on all their upcoming events and the release of their seasonal magazines. 7 October 2017 - This gorgeous couple married on the beautiful lawns of Bungaree Station, Clare hiring our wedding benches and easels. We loved what they did for their wedding sign! A gorgeous rustic window captures the artistic character of our wine barrel easels. The Rustic Barn wedding ceremony benches at Bungaree Station, Clare. At a Northern Adelaide Wedding Expo we heard about Peter & Emma who were battling cancer and couldn't afford the wedding of their dreams. Our hearts went out to the couple and when we heard how much they loved our wedding benches, of course we donated the whole set, it was the least we could to. THE room erupted in rapturous applause as proud groom Peter Williams made a grand entrance at Chateau Yaldara on Friday. It was an emotional moment for the young couple, made possible by the generosity of strangers. The couple were in the early stages of planning their wedding when Mr Williams had a sudden seizure in January. He was diagnosed with stage three brain cancer and given two to three years left to live. Mrs Williams, 28, said she was so grateful the community had helped her marry her “soulmate”. “I don’t know what I can say to say thank you,” she said. 4 March 2017 - Many photos by Felicity Jade Photography are featured right here on our website. Felicity is incredible to work with; she is so accommodating and has natural talent to capture the detail. She's young but don't let that fool you! Felicity covers every subject from newborns to portraits, engagements, maternity, weddings and events. We love, love, love the colour and character Felicity captured at our ceremony package shoot in Heywood Park, Unley.